Senior pets are some of our most special patients. We’ve seen them through the chaotic puppy and kitten stage and had many years to develop a strong relationship with them and now they are more willing to calmly spend time relaxing with us. Coventry Animal Hospital recommends a physical exam every six months for senior pets. We recommend feeding senior pets a high-quality food that is very easy to digest and contains anti-oxidants, omega fatty acids and an appropriate amount of protein and calories. Joint health supplements, soft padded bedding and neutral temperatures are also recommended. Deterioration of body systems may be painful and many geriatric pets benefit from pain medication. Routine blood work can trend organ function and determine if therapy for chronic kidney disease, hypothyroidism (in dogs), hyperthyroidism (in cats), diabetes or other diseases should be implemented. Routinely having masses assessed may catch cancer early and allow it to be cured. Just because your pet is old, it doesn’t mean that it should be slow or stiff, smell bad or be non-interactive and painful. Do not accept diseases in your pet simply because it is a senior. Unlike in people, your pet may not show you symptoms that you would associate with illness. 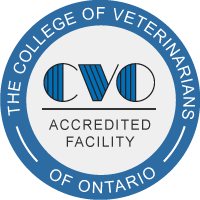 At Coventry Animal Hospital, we aim for early detection of disease in pets that may outwardly appear healthy. Our goal is to prevent or delay disease and death where possible. We also assess your senior pet’s current quality of life to determine whether measures can be taken to improve its daily comfort. Give our team a call to discuss your senior pet’s individual needs.